Any chance ASUS might consider lowering the minimum PWM cycle % on the current ROG motherboards? It used to be 20%, but this gen has 40% on the CPU_FAN header, other brands like MSI allow 12.5%, 25%, much lower than ASUS restictions, i always seen restictions on CHASSIS_FAN headers, but on CPU_FAN they always been much lower, dont understand why so high this gen. 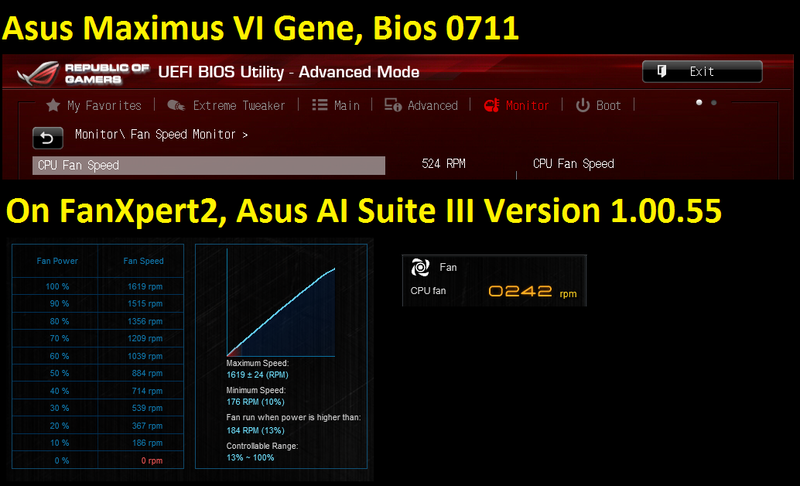 So is there any chance asus could release an update bios with lower "CPU Fan min. Duty Cycle"? at leat give us 20%, but if you can 10% would be great. All PWM fans are different some can other cant... but its nice to have the flexibility of going lower at the end user discretion, without needing to resort on AI SUITE III and FanXpert2. Last edited by Abula; 08-28-2013 at 06:15 AM. To help us help you - please provide as much information about your system and the problem as possible. Thanks you HIVizMan for bumping it, really appriciate your time, hope the engineers find this request viable and useful. HiVizMan, just wondering if you had any news from HQ, like if its possible or will it come in future revision. Im not interested on right away (ill wait for as long as needed), but im considering moving back to ATX, and this is among the things that im looking forward on the build. If its possible and will happen in time i will wait and go for HERO, but if it wont happen, then ill probably move on to MSI, as it has lower restrictions. Yeah I am sure that there will be movement on this issue. There were a number of users that had problems with the change in bios. Any news on this? I really hope that ASUS will change that soon! and some PCs not even running windows. overlocking and voltage controls in BIOS is more than a contradiction. It's just ridiculous! Can't see this one being changed fast. Too many users with fans that don't spin up complaining in comparison to you guys. Greater need wins no matter how illogical it may sound in this case. So why don't the engineers implement some kind of calibration/measurement cycle in the BIOS? Shouldn't be too hard to measure the lowest PWM duty cycle needed to make the fan spin! And what about users that complain about the PC not starting due to excessive ram timings? aware that deviation from standard settings could prevent the PC from running stable etc. Anyway... I'll stop whining now. For me it's easy: Will stick to another supplier in future. If someone (iow: I) have the impression that nothing moves... I have to move myself. Last edited by fw0815; 09-26-2013 at 09:26 AM. As matter of fact, the FaXpert2 software is pretty good, probably the best in the market, this owas one of the reasons i moved on to GENE VI, from my GENE IV, knowing that my gains on CPU were very little. The problem is that asus dont have it as a stand alone feature like RAMDISK, personally i think it should, but they have it with AISUITE III that imo is not needed for all users, specially for minimalist that dont like to load thier pc with a lot of software. You have starting temp is the first point where the bios will start to ramp up, and final temp where it will reach the maximum of % load on the fans. This also has 2 presets, frist is the idling or lowest % you want the fans to be, in my case 12.5% for case fans, and 37.5% for my CPU fan. And the second is max % you want to achieve on the the max temp, for example i find my noctua too noisy past 700rpm, so i set them up 37.5% as their max and on prime 95 goes to 670rpm, the CPU i left on 100% as the max, so it can reach 1100. Another good thing about MSI vs Asus is that MSI does give you 2 PWM fan headers instead of 1, CPU_FAN1 and CPU_FAN2, both are independently controllable, in the past on Asus my idea was to have the same FANs on all slots including CPU and ramp them all together, now i have more options, as i explain before, i have all my case fans on one PWM header (CPU_FAN2) and CPU fan (CPU_FAN1), so i can control them accordingly to what i desire in cooling and noise. One thing that i do not understand, is the way AI suite measure temps, not maching wiht any software baffeles me, i seen JJ explanation that takes a lot of reading from many sensors and creates what they so called more exact cpu temp.... but not matchign with anything i cant decide TJMAX is near so i need mroe cooling or that its too fan and i could lower my fans more to avoid noise. On MSI i can use whatever, in my case HWmonitor and coretemp, all the fan management is on the bios and reacts directly to the temps on those probes, you just have to tweak it down to what you want and see the results in windows under load and idle. Asus will still give you a lot more control than MSI on pure software, if you use PWM fan only on the CPU_FAN, and 3pin on CHA_FAN headers, you can control all individually and its more precisie in terms of it overwriting the BIOS limitation, but the bad is that its bunch with AI SUITE III. Im sorry raja, but this is not good enough. From your standpoint you should limit memory to 2133 because that way you dont have so many CODE 00 roming aorund cause they took memory too high and their CPU doesnt allow it... the greater good as you say. I came to asus because i wanted a tweakable board. 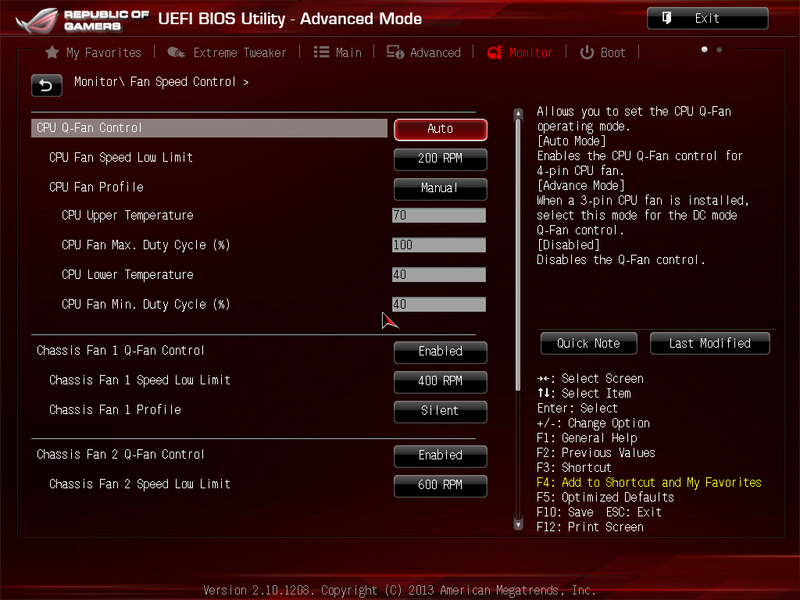 Even Intel motherboards have lower restriction than Asus on fan control on bios. Either way, dont worry about it, i already moved on, hope in broadwell or skylake you guys reconsider and find a way to make it work out.